Lord, When Did We See You Thirsty and Give You Drink? This week my e-mail brought news of a serious drought that is affecting the people of Kenya. Over two million people have had their lives disrupted by this unrelenting tragedy that has had far-reaching and devastating effects. Some of the issues are clear-cut and revolve around the lack of food, not only for the people but for their animals. The drought has required that herders leave their homes and families to search for water and food for their animals. The resulting turmoil is frightening. Husbands and fathers have had to abandon their wives and children, leaving them to fend for themselves. Those left behind struggle with hunger, disease and unimaginable poverty. And because the search for food and water often means trespassing on territory belonging to another tribe, violence and social chaos are everyday occurrences. In addition, the education of the children in these villages is completely in disarray. Here in Boston, The Society for the Propagation of the Faith has a long-standing relationship with the Archdiocese of Nyeri, Kenya through our Missionary Cooperative Program and through the regular sharing of Mass stipends provided by the people of our Archdiocese. Archbishop Peter Kairo tells us that he has 91 priests and that our assistance lets them “safeguard the sacramental life of the Church and the propagation of the Gospel. It also provides for the livelihood of the priests who actually bear and execute the pastoral projects” in his Archdiocese. Although The Society for the Propagation of the Faith is not a “relief” organization, the financial support from our donors enables missionaries to share some material benefits in addition to the spiritual. At our World Mission Sunday celebration last October we welcomed some of the Sisters from Nyeri; they joined us at the Cathedral for Mass and for the reception following. This year three of our parishes will host a priest from the Archdiocese of Nyeri for the 2011 Missionary Cooperative Program. Saint John’s in Chelmsford, Saint Gerard Majella in Canton, and Holy Trinity in Lowell will help us to continue our support of Catholics in Kenya who are in dire need of the most basic elements of life that we so quickly take for granted. For more information on the Church in Kenya and how the Pontifical Mission Societies are helping to support them, click here. Listen as seminarians praise God for the ability to follow their vocations, thanks in part to help from our donors. By now, readers are well aware of the immense earthquake that rocked Japan last week, followed by an incredible tsunami. Adding to the woes of the people is the now unstable state of Japan’s nuclear facilities. Their situation affects us all as brothers and sisters of Christ; it affects us directly as One Family in Mission because of the loss of one of our own. Fr. Andre Lachapelle, 76, a Canadian missionary, serving in Japan for 50 years as part of Canada’s Foreign Mission Society, died in the aftermath of the quake as he headed back to his parish to tend to his flock. Fr. Lachapelle also served as a prison chaplain for 25 years doing the work of many missionaries: tending to the marginalized. Please pray for him and the parish family he leaves behind. The United States’ equivalent of the Foreign Mission Society is the Maryknoll Fathers and Brothers. Founded 100 years ago from this office by our Society’s Director, Fr. James Anthony Walsh, Maryknoll has many priests on mission in Japan including Fr. Frank Riha from Holy Name Parish in West Roxbury. Though he and his fellow Maryknollers are safe, the job of rebuilding will be enormous. To help in this important task, we ask for your support by using our Easter Enrollment and Mass Cards during this holiday season. The offering for a one year enrollment in the Society is $5; members, both living and deceased, will be remembered at countless Masses said in the Missions during their year of membership. They will also be the intention of an Easter Sunday Liturgy celebrated by our Director, Fr. Rodney Copp. 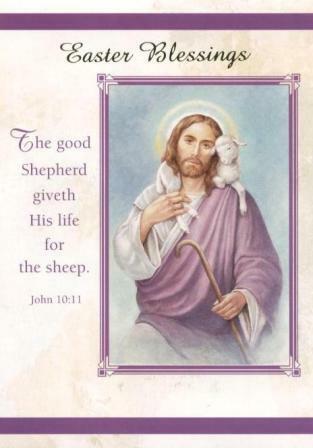 The Easter Mass Cards are offered for $10 each. These beautiful cards ensure that a Mass will be said by a Maryknoll priest in Japan, to whom the stipend will be sent. In that way, you will be making a direct contribution to the well being of an American mission priest in Japan, as well as ensuring that he is able to continue to serve the people that God has entrusted to his care. 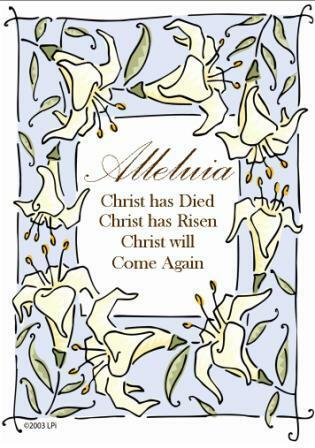 To order your Easter cards (Enrollment card on left, Mass card on right), please call our office at 617-542-1776 or email us at info@propfaithboston.org. You can also visit our website: www.propfaithboston.org and click here to download an order form. We thank you in advance for being part of our Mission Family as we reach out to those in immediate need. Recently, our readers learned more about our annual Missionary Co Operative Program; missionaries visit us in our parishes to help us more fully understand our connection to the spread of the Gospel around the world. Occasionally, we are able to proudly hold up one of our own as an example of those brave enough to trust the voice of the Holy Spirit telling them to “Go to the ends of the earth” to preach the Gospel. We did that just last week, featuring the work of Bishop Paul Duffy, OMI, Bishop of Mongu, Zambia. As part of his extraordinary work in Mongu, Bishop Duffy has worked closely with Fr. 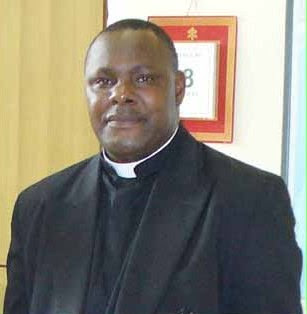 Bernard Makadani Zulu, National Director of the Pontifical Mission Societies (including the Society for the Propagation of the Faith and the Holy Childhood Association) for all of Zambia. Although not our native son, like Bishop Duffy, Fr. Bernard is a member of our “One Family in Mission” here in Boston; he not only receives Mass Stipends offered by our donors, he has also supplied us with many stories and pictures for use in this column and on our website. Imagine the surprise of both men when Fr. Bernard walked into Bishop Duffy’s office recently to find him reading a back issue of The Pilot, sent regularly from Boston by the Bishop’s brother. There, smiling up from our column was Fr. Bernard himself and the children of Zambia who had gathered, wearing the colors of the World Mission Rosary, to celebrate their membership in HCA. Bishop Duffy has obviously served his people well; his children are willing to share their faith in a most profound way. 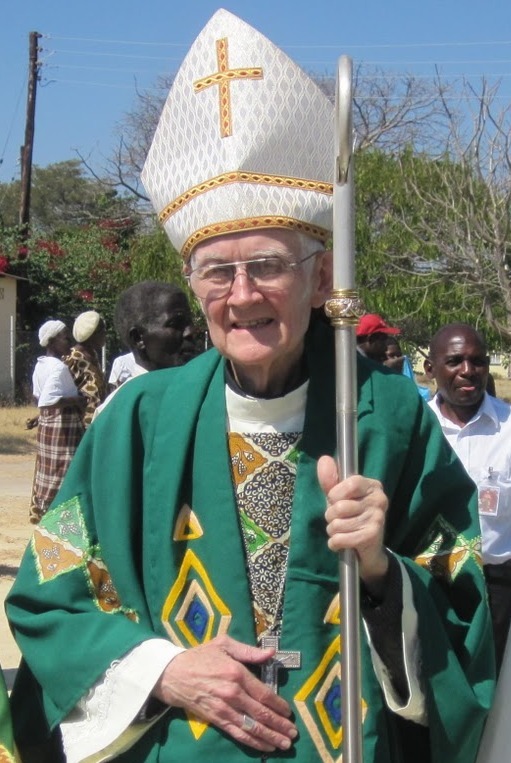 They will miss him soon – the Zambian Episcopal Conference announced on February 15 that the Holy Father has accepted Bishop Duffy’s resignation due to reaching the age of 75 – four years after it was submitted! He will be succeeded by Fr. Evans Chinyemba, OMI, a native Zambian. We wish both men many blessings as the Church family in Zambia continues to thrive. When most of us think of Christian martyrs, I’d be willing to guess that our minds go quickly to the early days of the Church, the days of the Coliseum and the catacombs. Or perhaps we think of heroes like Father Maximilian Kolbe who gave his life to save a Jewish prisoner’s life in the death camp at Auschwitz during World War II. The painful truth is that, even in this very sophisticated era of the twenty-first century, brave men and women, clergy, religious and laity, are still called to lay down their lives for the faith that means so much to them. And this is often accomplished by means of violence perpetrated against them, simply because they are people of faith. a Roman Catholic layman, was assassinated on March 2, 2011. Bhatti was the first Christian parliamentarian and one of the founding members of the organization All Pakistan Minorities Alliance (APMA) in 1985. He was considered a representative of all the religious minorities in Pakistan. Significant information concerning the contemporary situation in Pakistan was provided in a commentary by Father Robert McCulloch, a member of the Society of Saint Columban, who has spent more than thirty years as a missionary in Pakistan. I know Father McCulloch personally because he spent a summer in the Archdiocese of Boston several years ago. He was here to learn the basics of Tribunal procedure in order to assist his bishop in establishing a Tribunal. At the time I was functioning as a judge in the Tribunal of the Archdiocese of Boston. Pope Benedict’s missionary prayer intention for the month of March is that the Holy Spirit may give light and strength to the Christian communities and the faithful who are persecuted or discriminated against because of the Gospel. How appropriate this is in light of the difficult and dangerous climate in Pakistan where good people are persecuted and killed simply because of their faith. We pray for them and for those who would do them harm. For more information on the missionary activity of the Church, go to our website http://www.propfaithboston/.org. In many mission locations, funds from Society Membership are a substantial means of support. One such place is the Vicariate of Esmeraldas in Ecuador. Shepherded by Bishop Eugenio Fernandez, M.C.C.I, Esmeraldas is a place of great beauty and greater poverty. Stretching from the Pacific coastline to the interior, most of its residents travel by boat from village to village: there are no roads. Bishop Eugenio travels to the outskirts of his territory in a motorized dugout canoe, waving to the people who line the shore to greet him. The message he bears is one of hope – the outside world has not forgotten them. Catholics around the world through their Membership in the Propagation of the Faith are reaching out to help build churches, clinics and schools. In a very real way, your Membership helps Bishop Eugenio to bring that hope to where it is most needed. Each year every parish in the Archdiocese of Boston hosts a visiting missionary in order to participate in the Missionary Cooperative Program of the Society for the Propagation of the Faith. These missionaries may be bishops, priests, men or women members of religious communities, or lay representatives of various missionary groups. Your generosity to these missionaries enables them to carry out the work of preaching the Gospel in ways that would otherwise be impossible. The Archdiocese of Boston has been fortunate to number among its native sons several bishops who shepherd missionary dioceses across the globe. One of these dedicated missionaries is Bishop Paul Duffy, a member of the Oblates of Mary Immaculate and the bishop of Mongu in the Western Province of Zambia. 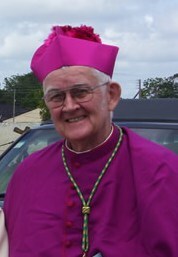 Bishop Duffy grew up in Saint Catherine Parish in Norwood and is the first bishop of the Mongu diocese, established in 1997. The diocese includes more than 66,000 Catholics in only thirteen parishes. Under Bishop Duffy’s leadership, several new initiatives have taken place. The number of parishes serving over 66,000 Catholics in the diocese has increased from nine to fourteen. He has also increased the numbers of the diocesan clergy, and welcomed five new congregations of Women Religious to minister there. According to the information on the Bishop’s blog: the Western Province is the poorest and least developed of Zambia’s nine provinces. Hence the poverty is very evident and is a challenge for the Church. Great efforts are being made to uplift the lives of the people, encouraging them to become self-reliant. This means that, in addition to addressing the spiritual needs of his people, Bishop Duffy has to be concerned with their material welfare as well. Like many missionaries, he depends heavily on the support provided by the Missionary Cooperative program. Our Missionary Cooperative Program will begin shortly. When a missionary visits your parish, please remember to be generous with your financial support and with your prayers. For more information on the work of the Society of the Propagation of the Faith, please visit our website, http://www.propfaithboston.org/. Helping children develop a deeper understanding of their own missionary vocation is at the heart of the Holy Childhood Association. We teach them about the wonders of God’s grace at work in us: while we are all called to follow Christ and spread His Gospel, each of us is given talents with which to work. The way we use those talents in serving God is our vocation – it is who God calls us to be. On a recent visit to the Religious Education students at St. Clare Parish in Braintree, we talked about the differences we celebrate as we follow the same path. The students shared their gifts - one sang, another played hockey, another felt his talent was simply to be helpful every day. We talked about people in the missions; didn’t God give them talents? Don’t they have vocations? Of course they do, but in many places in our world without the presence of a missionary to help set them on the God’s path, many never find them. From halfway around the world, at another St. Clare, came a story of a vocation found. Fr. 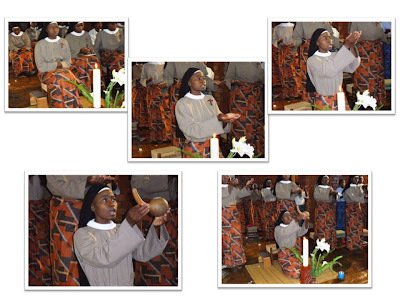 Bernard Makadani Zulu, National Director of the Pontifical Mission Societies in Zambia emailed me the story of Sr. Alinane Phiri professing her final vows at St. Clare Monastery in Lusaka. Fr. Bernard credits Sister’s vocation to two things: the work of missionaries and her faith formation in her family. “The splendid growth of the Church in Zambia is due largely to the selfless dedication of generations of missionaries,” he says. “The land of Zambia is sown with the tombs of courageous heralds of the Gospel.” Fr. Bernard also related that Sr. Alinane is from a very spiritual, deeply Catholic family. Faith came first in her household and it bore much fruit. Sister has a brother who is a diocesan priest and two sisters who are Religious Sisters. Sister Alinane will be sharing the talents God gave her every day; as a girl, she learned to pray constantly and work hard. As a contemplative nun, Sister will participate in daily Mass and nightly Eucharistic adoration. She will sing the Liturgy of the Hours seven times a day with her community. Sister will also sew priests’ vestments with specialized needlework to be sold to help support the Monastery. While Sister’s vocation has been secured, the Holy Childhood Association continues to work to help children to pray and sacrifice their way towards finding their own. For more information on the work of the Holy Childhood Association in Zambia, visit our website's HCA: Stories From the Missions page.